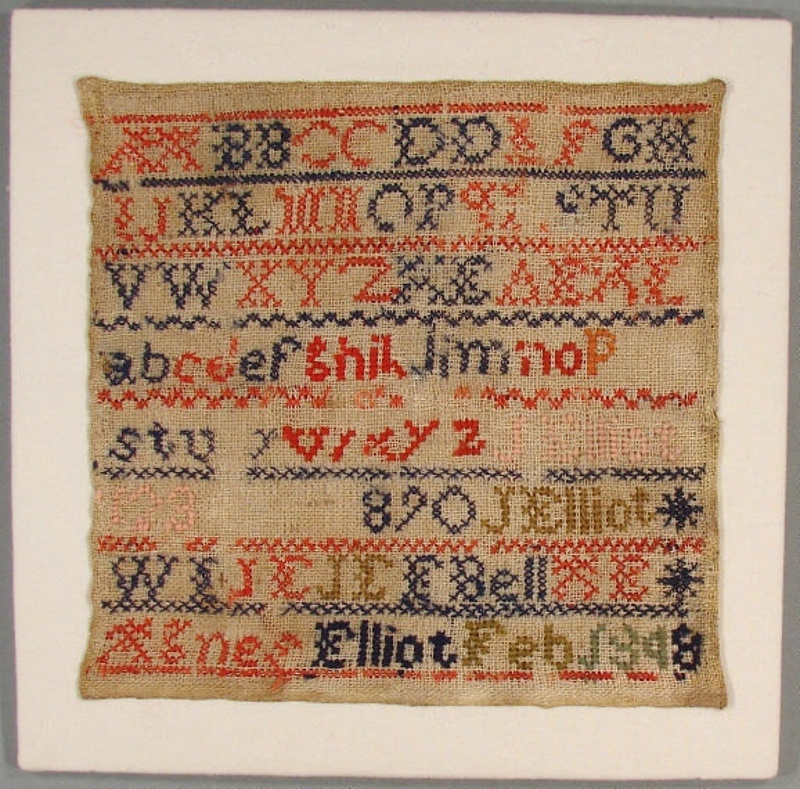 This sampler demonstrates features characteristic of many Scottish samplers. These include the colour scheme of green and red threads, the flat-topped ‘A’ in the alphabet, and the initials and names of family members as well as that of the sewer. Agnes Elliot was the wife of a notable Dunedin settler, Colonel Nathaniel Y A Wales, a pioneer architect and Dunedin mayor who designed many of the city’s major 19th century buildings. But while much is known of her husband’s life, we have few details on Agnes. 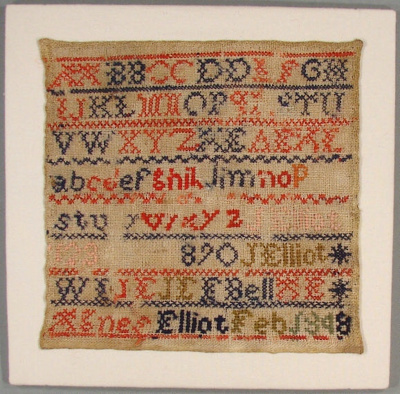 A Scottish origin is presumed and the initials and names on the sampler probably contain vital clues about her parents and siblings. Family tradition has it that Agnes was on the same emigrant ship that took Nathaniel Wales from Scotland to Australia and that he was much attracted to her on the passage. Unfortunately, Agnes was engaged and heading to a reunion with her fiancée in Sydney. Fortunately for Nathaniel, the unknown suitor never appeared and he was able to step in and take over her care. The couple were duly married in Melbourne in 1857. Nathaniel came over to Dunedin at the end of 1861 and Agnes followed with the family a few months later. They began their Dunedin life in a ferntree cottage that he had built in Sawyers Bay. Altogether they had five children together. Agnes died in Dunedin in 1895 – the year her husband was Mayor of Dunedin - aged 60 years.